The number of new breweries and pubs making the scene in Portland is remarkable. Although it probably lags the proliferation of cannabis shops, each week Willamette Week or The Mercury will feature either a totally new brewery or another brewpub for an existing establishment. Just a few examples from a January, 2018 posting of Newschoolbeer.com are Great Notion Brewing (NW), Migration Brewing (Gresham), Modern Times Brewing (SE), Ruse (SE), Stormbreaker Brewing (St. Johns) and Thirsty Monk (SE). 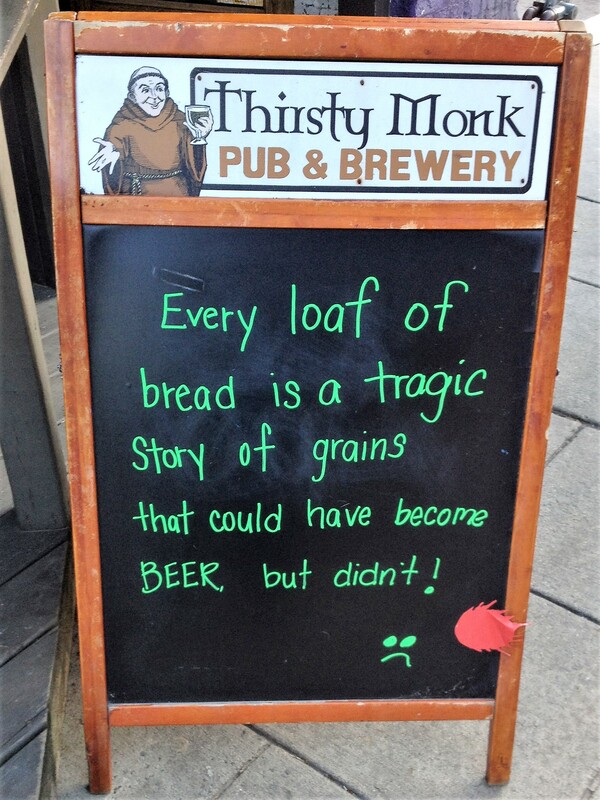 My wife and I did like the sign below in front of the Thirsty Monk Pub and Brewery when we visited Asheville, North Carolina – it’s home base. It conveys a certain wisdom! Speaking of monks, don’t forget the much-anticipated Benedictine Brewery at the Mount Angel Abbey which should brew its first batch on site in the next three weeks with Grand Opening of the St. Michael Taproom on September 22nd. While the Thirsty Monk Brewery is an Asheville, North Carolina corporation, the ownership and brewing at the Benedictine will be by actual monks including General Manager Fr. Martin Grassel and Head Brewer, Fr. Jacob. It will be one of only three such brotherly enterprises in the United States. 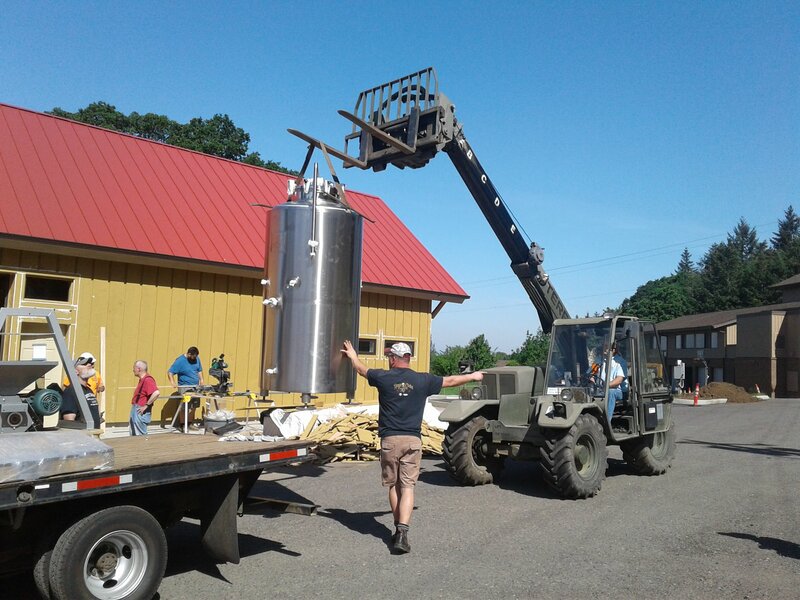 Installing brewery equipment at The Benedictine Brewery earlier this month. But to experience one of Portland’s classic establishments, you should follow my lead and by the end of the summer, travel north on Naito Parkway (fighting backed up traffic to accommodate the ill-advised “Better Naito” Bikeway) then on to NW Front Avenue to the Dockside Salon and Restaurant. And make a point of personally thanking the owners Terry and Kathy Peterson for their initial entrepreneurial spirit in 1986 and the perseverance and courage to maintain this great saloon in the face of surrounding development. 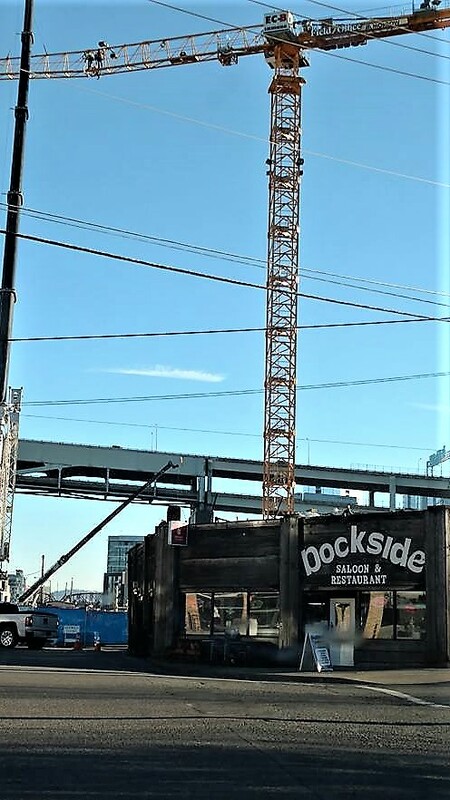 The Dockside doesn’t have the most robust tap list – seven draft beers including three rotating seasonal on tap, but it carries about fifteen different bottled beers plus a good selection of wines and a full cocktail menu. Happy Hour is from 4:30 to 7:30 Monday-Friday and rotating craft beers – normally $4.50 are $1.00 off as is the case with Lagunitas. Coors Light is also $1 off from the regular $3.75 but you can get a PBR for $2.75 instead of the regular $3.50. And well drinks – normally $4 are $3.25 with wine reduced by $1 from the regular price of $6.25. 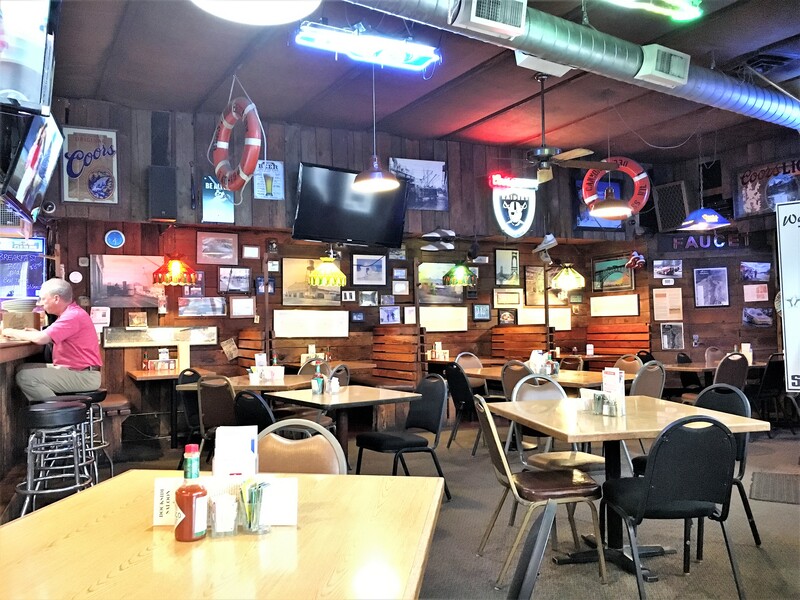 They also have an outstanding Sunset Menu with six options including a burger, bowl of clam chowder, chicken quesadilla, Caesar salad, beef tostada or three sliders – each for an astounding price of $3.95. That means you can have a burger, chips and a pint of PBR for $6.70! 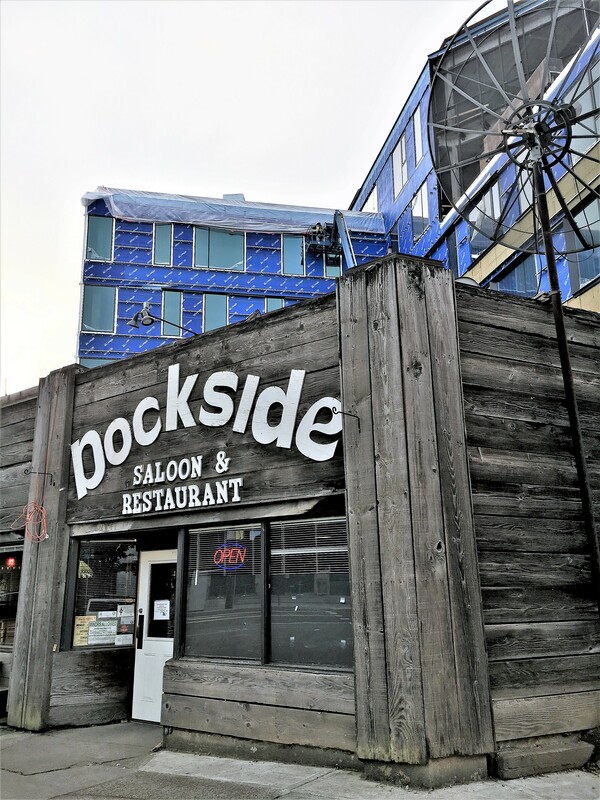 Entering The Dockside is like stepping into an old neighborhood diner – others in Portland visited previously by Thebeerchaser are Sloan’s Tavern and Crackerjack’s Pub. Historic pictures, old beer signs and memorabilia adorn the walls. You immediately feel welcome and the staff greet you like you are family. And they are family themselves. For example, Karen, the lead server has worked there for 27 years and Angel, the chief cook, for 22. Of course, it helps when you accompany a regular – on all my visits of the last several years, I have joined Dennis B. Ferguson for breakfast. And breakfast is one of many reasons you should visit The Dockside. 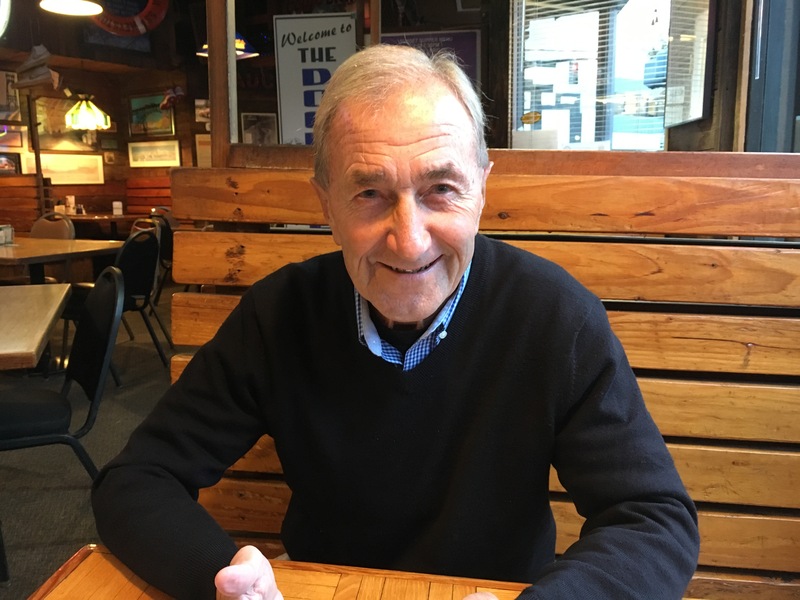 Denny, who initially retired after a very successful career as an insurance executive, is now the Senior Philanthropic Advisor for the Portland State University Foundation. Besides knowing everyone in Portland, he is the most optimistic and cheerful person I have ever known. (He has such a positive viewpoint that each time he makes a withdrawal from the ATM, when the cash is delivered, he shouts, “I won! I won!”). The sixteen primary breakfast options are all named after Portland-area bridges and the prices are very reasonable and the food plentiful and delicious. The choices range from the Burnside Bridge (2 eggs, hashbrowns and toast for $8.25) to the robust St. John’s (7 oz. ribeye steak, 2 eggs with hashbrowns and toast for $14.75). 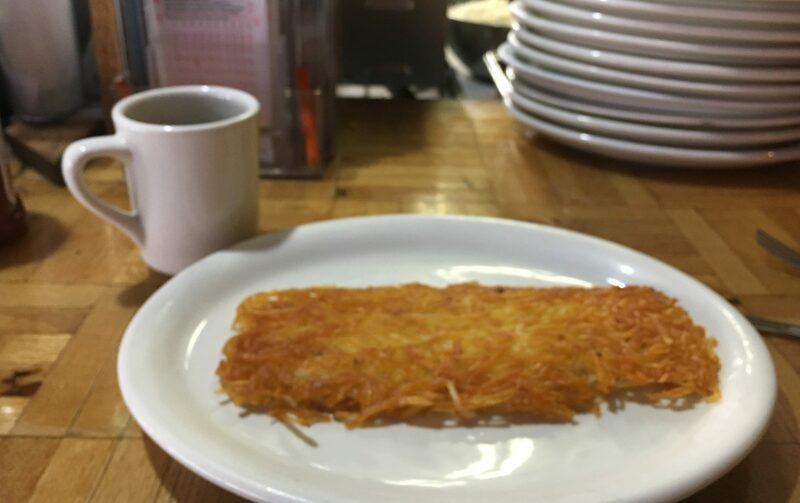 Legendary breakfasts – especially the hashbrowns..
For lunch and dinner, they also have a multitude of sandwiches, soups and salads. Oh yes! If you hit The Dockside on Tuesdays between 4:00 and 7:30, you can get three tacos for 1.50! 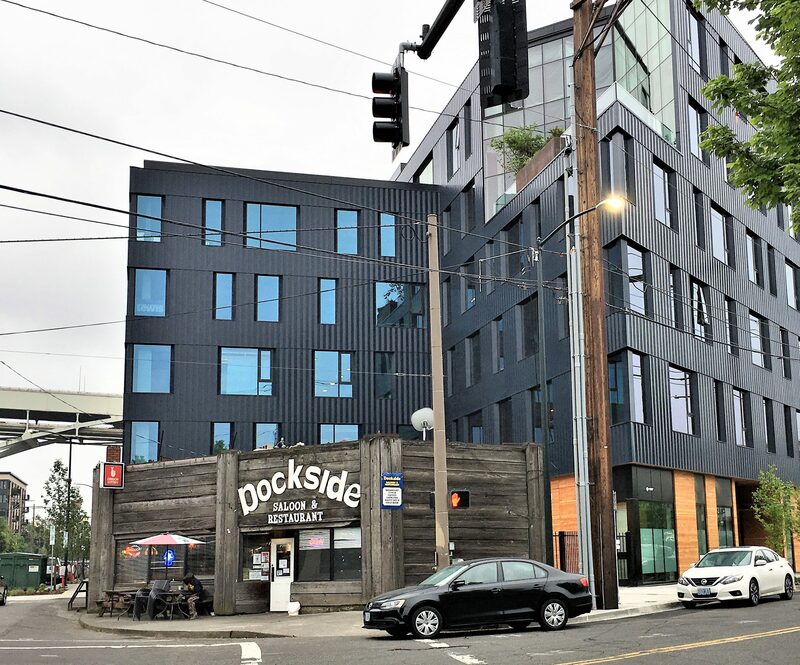 Any review or article on the Dockside will inevitably mention the connection with Portland’s infamous “celebrity,” former Olympic ice-skater Tonya Harding. Although she had not been to the Dockside, her then husband, Jeff Gillooly, purportedly got rid of a bunch of trash including papers in the Dockside dumpster in 1994. 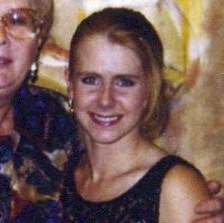 Notes in an envelope appeared to provide evidence of her complicity in the ill-fated attack on Nancy Kerrigan. 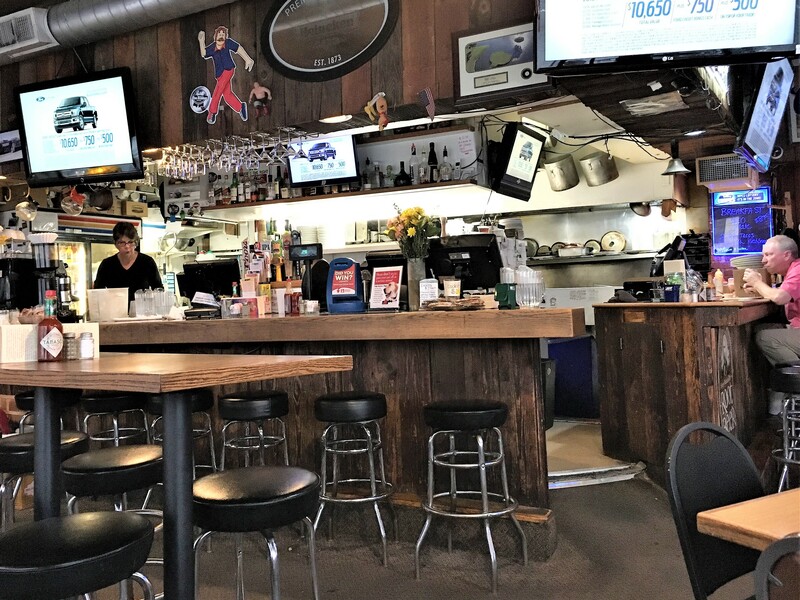 Karen confirmed the accuracy of a Willamette Week article on February 10, 2016, where you can find out about the commercial project which surrounds the eatery. 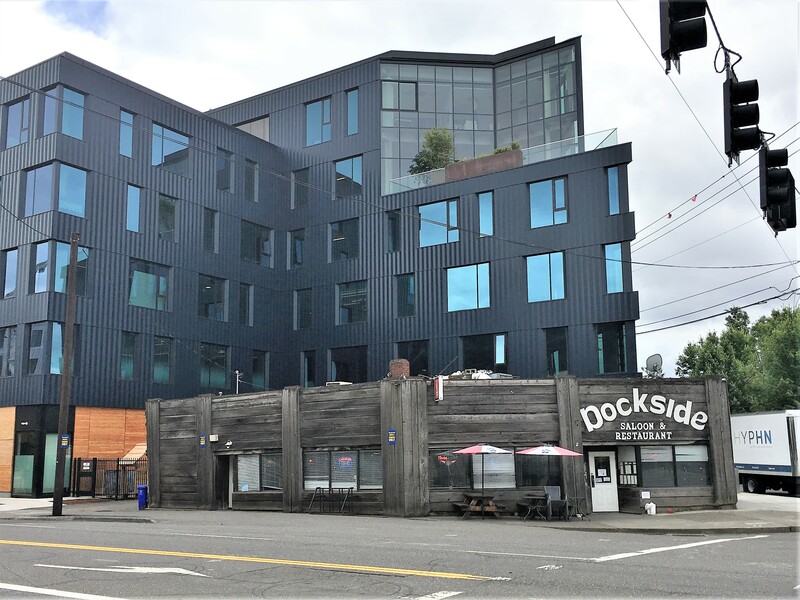 The original developer tried twice to buy out The Dockside, but Terry and Kathy gave them the thumbs down. 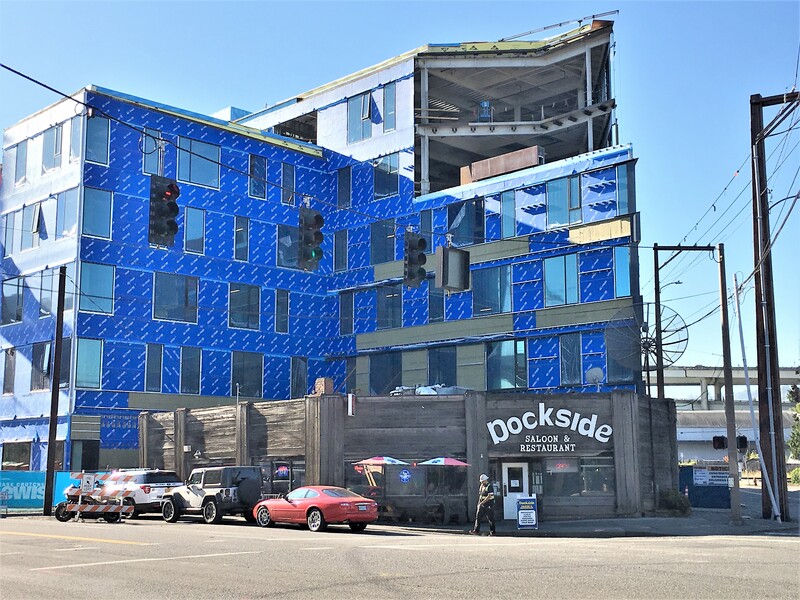 ‘The Dockside was not on the table,’ says Jonathan Ledsma a developer for Project^. ‘I wasn’t interested in purchasing it. 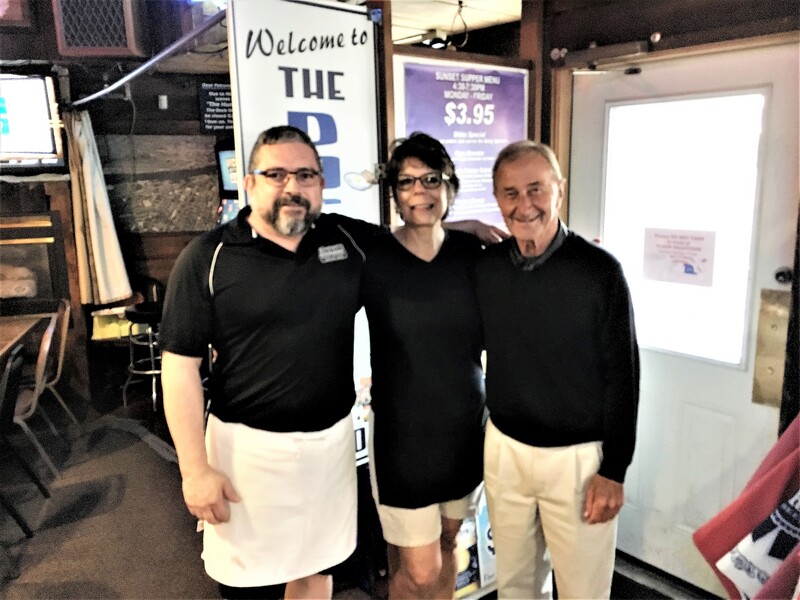 Ledesma says they carved out extra space along the lot line to give the bar some breathing room, and have been in constant contact with Kathy and Terry Peterson, Dockside’s owners. 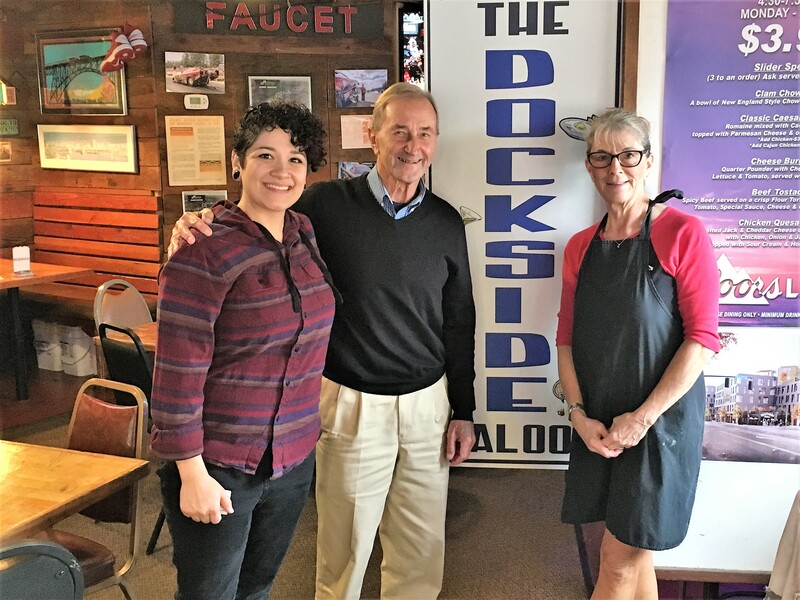 Now if you want to go to an establishment named The Dockside, you can also choose very upscale options in Wilmington, N. Carolina; in North Tonawanda, New York – along the Erie Canal; on the shore of Lake Michigan in Oconto, Wisconsin, on York Harbor in Maine or for delicious ribs and lobsters, in Hyannis Harbor on Cape Cod. 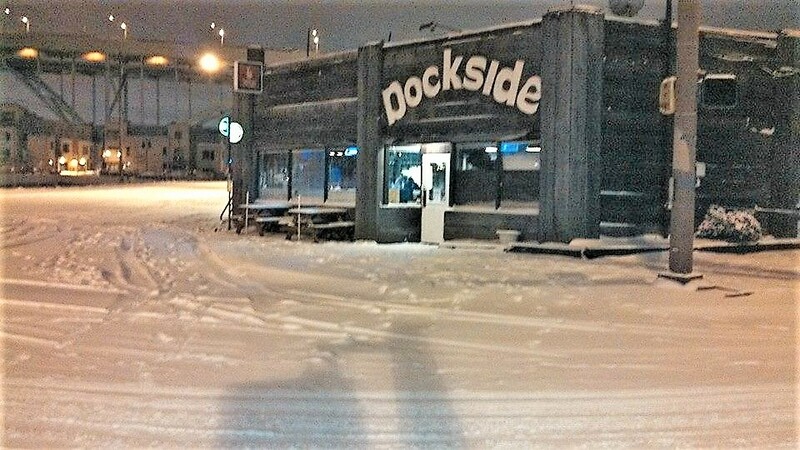 However, Thebeerchaser will lay odds that the best option is Portland’s own Dockside Saloon and Restaurant – and ours is not even actually on the water…..On weekdays they are open from 6:00 AM to 9:00 PM. And when you enter, say hello to Karen, Angel, Ashley and owners Kathy and Terry. “OK, this is SO Portland…this little gem of a restaurant is hidden in a sea of condos, apartments and commercial buildings along Front Avenue. It has been a restaurant since the 1930’s and must NOT be overlooked. Owned and operated by a local Portland family for over 30 years (who can say that?). The food is down home. 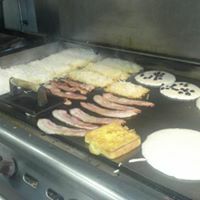 Scratch biscuits, home made hollandaise sauce, daily soup, eggs cooked to perfection and THE BEST hashbrowns and bacon anywhere! All at very reasonable prices…..
Of course, if you really want to make it a winning day, call Fergy and invite him to come with you. Then go out and buy a Megabucks ticket! Fergy – Like winning the lottery!